Focuses strictly on your bicep muscle group. Get a strong workout and build thick, crowned biceps when you use this machine in the comfort of your own home. The pad is angled specifically to isolate the biceps to the maximum level. The bicep curl machine is constructed from heavy-gauge steel. The bench features an extra-wide seat and arm pads for your comfort. ●The Arm Curl Bench allows you to put more intensity into working your biceps. ●It is built with comfort, function, and durability in mind, allowing arm work to be completed using proper form. ●Six different arm rest adjustments designed to fit your body. ●Dumbbells and Weights not included. Crazy Guaranteed: If you don't like your Fitness Preacher, contact us and tell us your return reason, we'll instantly refund your money and you can keep the Fitness Preacher, no questions asked. It's our promise. ●Thickness of the pad: 2"
●1. Simply Assemble is required according to included instruction. ●2. Please warm up fully before training to avoid physical injury. 【PRACTICAL DESIGN】Ideal for in-home and light institutional use,Build and define your body. 【STURDY AND DURABLE】High density, tapered, dual-layer seat pad measures. 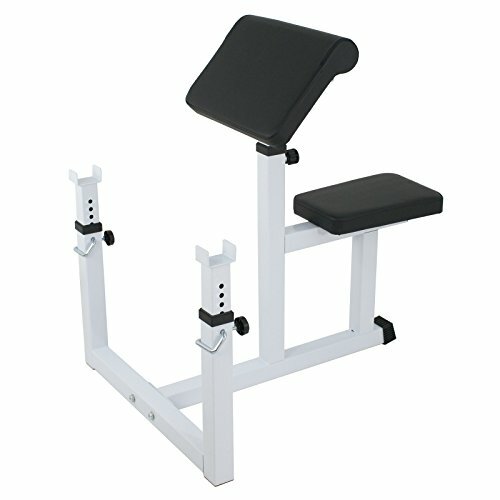 【HIGH QUALITY】Adjustable, Extra Wide & Thick Gym Quality Padding. 【HEIGHT ADJUSTABLE】Six different arm rest adjustments designed to fit your body. 【EXTRA COMFORT】It is built with comfort, function, and durability in mind, allowing arm work to be completed using proper form.